Kim Kardashain was carrying a Hermes purse during an outing with husband Kanye West earlier day. 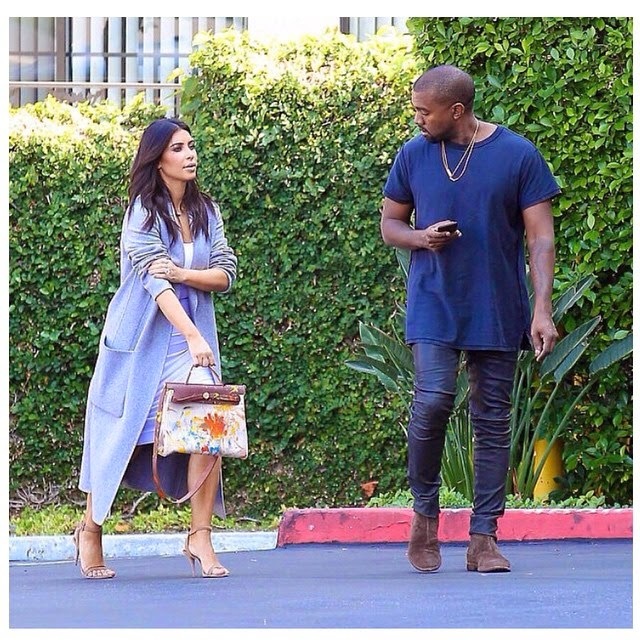 The purse was a combined gift from Kanye and their one-year-old daughter North West who had hand-painted the bag for Kim's last birthday. "Kanye had a box [with an Hermes purse in it] and I opened it up and it was all painted really cool and on my computer was this message that said 'Play' and it was a video of my daughter sitting outside painting the purse. I had thought it was this new artist who had painted this purse [but] it was my daughter. It was amazing." Last year for her Christmas present, Kanye West had also given Kim a Hermes Birkin bag, that one was hand painted by professional artists. i like her dress,thats all.